Zig Ziglar once said, “You don’t build a business, you build people, and then people build the business”. The header for this piece is actually a striking quote from Peter Schutz, the former CEO of Porsche. Schutz is the American auto executive noted for engineering the revolution that now put Porsche ahead in the automotive industry. When Peter W. Schutz took over as President and CEO of Porsche AG in January 1981, the company was experiencing a difficult period. In 1980, Porsche had recorded its first ever losses and somewhat at the lowest ebb. 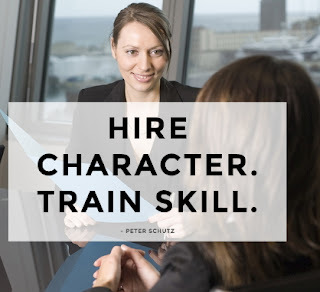 During his tenure, Peter W. Schutz not only changed the company’s strategic direction but also gave the sports car manufacturing giant a new philosophy: “Hire character. Train skill”. I want to emphatically underline the fact that this write-up is not meant to trivialize skills in any way. I have always believe that capacity is a sum total of character and competence (skills). The most appropriate approach is to always have the two (character and skills) blended in a healthy way, but reality will sometimes push us to make a choice between the two. The truth is that character is always supreme. One of the most impressive architectural feats and the greatest military defense project in history is the Great Wall of China. In 1987, UNESCO designated the Great Wall a World Heritage site, and a popular controversial claim that emerged in the 20th century holds that it is the only man-made structure that is visible from space! Originally conceived by Emperor Qin Shi Huang (c. 259-210 B.C.) in the third century B.C. as a means of preventing incursions from Mongolians and barbarian nomads into the Chinese Empire, the wall is one of the most extensive construction projects ever completed. History has it that when the ancient Chinese decided to live in peace, they made the Great Wall of China; they thought no one can climb it due to its height. During the first 100 years of its existence, the Chinese were invaded thrice, and every time, the hordes of enemy infantry had no need of penetrating or climbing over the wall because each time, they bribed the guards and came through the doors. The Chinese built the wall but forgot the character-building of the wall-guards! Though, the great wall has over the years become a powerful symbol of the country’s enduring strength and spirit, but it has actually been a good reminder to the Chinese of the superiority of human character. The Chinese realized much later that the best defence against the enemy is not a fortified wall but a fortified character! Thus, the building of human character comes before building of anything else. Many companies hire employees for their character and then train them on the job. They do this with the idea that you can teach skill, but cannot change a person’s character. One’s character can be considered more valuable than an MBA or PhD. A person can have all the necessary experience and skills, but if their personality does not fit the company’s culture, are they really the right person to hire? In a perfect world, you would hire someone whose character is equally as great as their skills. However, there are cases where these two employability yardsticks are mutually exclusive. In any case, if we are left with making a critical choice between character and skill, we should prioritize character. Skills can be acquired and mastered over the years, but character defects are most times irredeemable! The character a person brings into the job is more important than the skills he/she brings. The greatest liability in an organization are people with nagging character defects. Someone once said, “They can’t kill your dreams, so they assassinate your character”. The easiest way to assassinate your dreams is to surround yourself with people of questionable character. Our dreams can withstand any form of assault but not a defective character. The greatest killer of dreams is not the enemy but our character! People with great visions and dreams are always very sensitive to the character of their employees. It is very appalling to know that most times we hire skilled people that we end up firing for character issues. I have seen the same pattern repeated over and over again, and the candid truth is that this defective cycle will continue until we put priority on staff character. Lack of work ethic, selfish behavior, poor teamwork, lying, cheating and poisonous attitudes are the most common reasons skilled people fail. One day, one of the staff members in the institution where I am presently working as the Dean of Schools was dismissed for what my Coordinator termed as ‘destructive tendencies’. He was highly skilled but the decision to let go of him was really expedient. Over time, I came to realize that it is not everyone you lose that is a loss! If an entrepreneur is so much focused on the company’s culture, ethics and values, then character is sacrosanct. Many big companies have spiraled into oblivion just because of character defects of the managers and employees. It’s easier to train a person of good character to do a job well than to develop character in a skilled but unprincipled employee. If you have to choose, hire for character and train for skills. One of the HR gurus on hiring and employability, Michael Josephson once said, “In today’s business environment, character and ethics are critical competencies of leadership; without them, a capable person is just another major risk”. As a leader, always look out for character and don’t be distracted by talent! One of the major regrets of my entrepreneurship journey has been the issue of bringing people around me that were full of zeal, enthusiasm and skills but were deeply flawed character-wise! Character defect can initiate a chain reaction that can bring down any institution or organization if not quickly checked. One of the most dangerous and delusive approaches that I needed to drop in my entrepreneurship journey over the years is trying to compensate for character defects by improving on employees’ skills. Skills can never compensate for character! In fact, the greatest liability in an organization are people with nagging character defects. Employees with character flaws are not only self-destructive but can most times bring down a whole organization to its knee. A character flawed-employee that is not checked is just a disaster waiting to happen. I am privileged to be part of the management of an educational institution, and this affords me the opportunity to always be on the board of the interview and recruitment panel. We have a scale of 100% and the parameters are as follows: Reliability (20%), Teachability (20%), Confidence (20%), Communication (20%) and Appearance (20%). Under these five parameters are other sub-parameters that I might not be able to delve into. A good hiring process must be able to discern whether the applicant is reliable and trustworthy. Being teachable is also very important as this ensure that the applicant can be trained on the job. Henry Ford once said, “The only thing worse than training your employees and having them leave is not training them and having them stay”. Confidence measures the level of experience and applicant’s competence. Albert Einstein said, “Without hope and confidence, nothing can be achieved”. Ability to communicate efficiently and effectively is sacrosanct as 70% of any employee’s job is linked to communication. Lastly, appearance must never be trivialized as it is a deeper reflection of the applicant’s approach to presentation. The real work of an entrepreneur is getting the right people, every other things can be sourced for. A combination of good work ethic, humility, integrity, simplicity, punctuality, courage, selflessness, dedication, empathy, and maturity will always beat talent and skills at any time! Thomas Jefferson, the third President of the United States of America once said, “Nothing can stop the man with the right character from achieving his goal; nothing on earth can help the man with the wrong character”. I will love to recommend the book, Character Above All: A compilation of ten essays on the Presidents of United States from Franklin D. Roosevelt to George Bush. People cannot climb beyond the limitation of their character.